To accurately inform Baptists and others of relevant news, promote the work of Christ and encourage inspirational living. To be the preferred source of Kingdom information. It was in 1896 that motion pictures premiered, Henry Ford drove his first car in Detroit, Tootsie Rolls went on sale and the first modern Olympic Games were held in Athens. 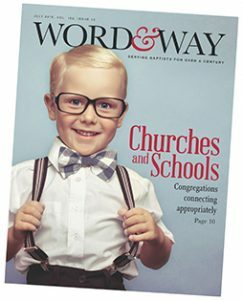 It was also the year in which Sanford M. Brown also began Word&Way as a weekly newspaper for Missouri Baptists that would contend for the “Word” and point readers to the “Way” — Jesus Christ. The Central Baptist began in 1866 and operated out of St. Louis, still thriving when Word&Way Came onto the scene in July 1896. Even Word&Way‘s Brown, a former assistant editor of The Central Baptist, regarded it as the “regular denominational paper,” and he did not intend Word&Way to be a threat. But Brown did want to present a different point of view on issues like the authority of the Bible, Landmarkism and the place of women in the home. Increasingly, the General Association came to feel that the state needed just one newspaper, lest the unity of Missouri Baptists be threatened. In 1912, Word&Way purchased The Central Baptist mailing list and published a single newspaper under the banner The Word&Way and The Central Baptist. The Central Baptist was dropped from the name in 1947. Because of the merger, Word&Way today represents more than 150 years of continuous newspaper service to Missouri Baptists. Founder Sanford Brown was the first of nine editors of Word&Way to date. He was particularly suited for the task with his service on The Central Baptist‘s staff, his background as a pastor and his service as executive secretary of the General Association. Brown was the paper’s field man while his co-editor, Robert K. Maiden, was charged with the day-to-day routine of getting out a weekly newspaper. The pair worked together from 1896 until 1929, when Maiden retired. Maiden was succeeded by Brown’s son, Joseph, thus forming a father-son team as co-editors. When the founding editor died in 1938, his son became the first single editor of the newspaper and served until 1945, when the General Association purchased Word&Way. With new ownership came a new editor, Lewis A. Myers, who was a World War II chaplain and former editor of the Baptist newspaper in Arkansas. He began in 1946 and served until the fall of 1947, when he took a similar position with the paper in New Mexico. The next editor, H.H. McGinty, had only limited editorial experience, but he was convinced of the value and importance of Word&Way. McGinty came to the role from the pastorate of First Baptist Church, Cape Girardeau, and retired in 1967 after 20 years of service. Divisions among Baptists in the state in the 1970s led directly to Edwards’ resignation in 1975 after eight years of service. The next editor, Bobby S. “Bob” Terry, came on the scene as Missouri Baptists moved the newspaper away from an inordinate amount of control by the executive director. The newspaper focused on matters that unified Missouri Baptists and promoted state convention causes. The newspaper garnered a number of awards from the Baptist Communicators Association, Associated Church Press and the Evangelical Press Association, a tradition that continues today. Terry resigned in 1995 to assume the editorship of The Alabama Baptist, where he still serves. Bill Webb succeeded him in 1996 during Word&Way‘s centennial year. Webb served as former editor of The Illinois Baptist and director of communications for the Illinois Baptist State Convention, as well as a staff writer for the Foreign (now International) Mission Board, SBC. Webb retired in 2016. The Board selected our current editor, Brian Kaylor, in November of 2016. A longtime staffer with Churchnet and Ethics Daily, Kaylor also previously served as a freelance writer for Word&Way. The newspaper became a separate agency of the Missouri Baptist Convention on Jan. 1, 2001. Later that year, in the midst of bitter infighting among Missouri Baptists, Word&Way trustees amended the paper’s articles of incorporation to provide for self-election of trustees. It was not a decision made lightly. As they debated, the trustees feared that the paper may not be able to survive the transition, and understood that it would result in personal sacrifices on the part of many of them. Finally, they determined it was the right move for Word&Way and for the continued existence of a free and fair press for Missouri Baptists. Shortly afterwards, the Missouri Baptist Convention removed Word&Way from their budget, resulting in the loss of about $450,000 – almost half of the operating budget. The newspaper exists today because of the organizations, institutions, churches and individuals that stepped in to provide continued prayer and financial support. In 2008, trustees voted to embark on an ambitious capital fundraising campaign to provide increased stability for the future. Then, the decision was made in 2013 to expand news coverage to include other Baptist groups located in and around Missouri. Content now includes American Baptist news and churches in Kansas, Nebraska and other areas. It is the desire of Word & Way to be a unifying force in Baptist life. Another milestone was reached in July 2015, when Word&Way transitioned from a biweekly newspaper to a monthly magazine. Our staff and trustees take pride in serving all Missouri Baptists and reporting the work of every Missouri Baptist institution. We have benefitted from those who preceded us and are indebted to all of them.